$20 cover gets you in for both sets, so stay all night! First come sits closest to the stage! Beer and wine are served. Ana Montes presents Flamenco Danzarte Student Showcase at The Can Can in Seattle's Pike Place Market. A chance for the students to show off what they've learned!!! Ana is dancing in this a lot too!! ANA MONTES IS DANCING AT THE CAN CAN! 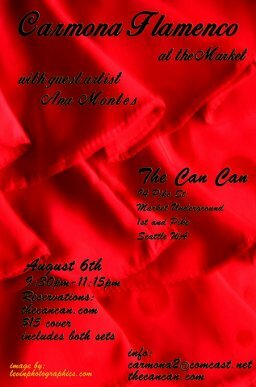 Ana Montes performs as a guest artist with Carmona Flamenco at The Can Can in Seattle's Pike Place Market. Ana Montes and Friends present a Variety Show with proceeds going to benefit ROOTS Young Adult Homeless Shelter in Seattle's University District. All sorts of fabulous dance with special guest artists, some great R&B / Soul music and voice... this show is going to be INCREDIBLE!!!!! Jonathan Porretta (Principal dancer with Pacific NW Ballet) and friends - special dance!!! Sunday, March 24, 2013 at Benaroya's Nordstrom Hall at 2:00 p.m.
Ana will be dancing in Celebrate World Music! on Sunday, March 24, 2013 at Benaroya's Nordstrom Hall at 2:00 p.m., featuring original gorgeous world music by Seattle's top composers and musicians!! Saturday, April 13, 2013 at 8:00 p.m.
Ana will be dancing with Carmona Flamenco at The Sallal Grange in North Bend, WA. This is a "tablao" performance like at Cafe Solstice. Two 50 minute sets. $25 Includes performance, appetizers and dessert!!! Ana Montes and Flamenco Danzarte performing at FOLKLIFE 2012! Friday May 25th at 6:30-7:00 p.m.
On the International Stage in the Exhibition Hall, under Pacific N.W. Ballet school. Ana will be dancing as guest artist on Sunday, October 2nd, 2011 at 6:00 p.m. with Ricardo Diaz and his show, FLAMENCO INTERNATIONAL, at the Seattle Center House Theater (downstairs from the Center House food court). We don't get male flamenco dancers and singers often in Seattle so come see the show, 'cause it's going to be great! 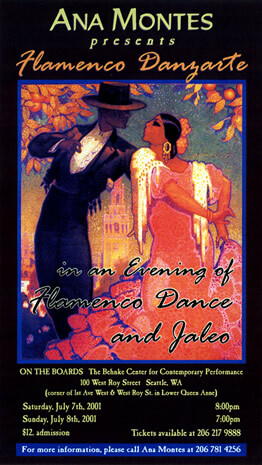 Tickets available online from Brown Paper Tickets and search for Flamenco International in Seattle. Ana Montes and Flamenco Danzarte at FOLKLIFE! "Palmas" Flamenco clapping workshop in the Rainier Room. 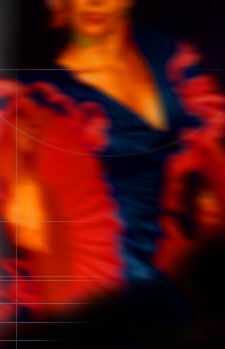 Monday, May 30th at 3:45 p.m.
BIG FLAMENCO PERFORMANCE OF ANA MONTES AND FLAMENCO DANZARTE STUDENTS IN MARCH!! 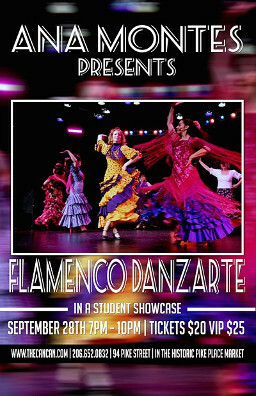 Reserve your tickets now for the next big student show of Flamenco Danzarte and Ana Montes!! Ana is performing with Carmona Flamenco and special guest dancer Timo Lozano for an evening of incredible flamenco. www.kpcenter.org for tickets and info. ANA MONTES & FLAMENCO DANZARTE PERFORMING AT FOLKLIFE!! Ana will be performing on the International Stage in the Exhibition Hall with her students for the Folklife Festival. Come see some new numbers and some crowd favorites!! Learn how we clap in flamenco, and learn clapping patterns in the major rhythm we work in. This is percussion at its most artistic level and your hands are the instrument. Ana will be dancing in the Lyric Opera Northwest's production of Giuseppe Verdi's opera La Traviata. Beautiful music you will recognize, beautiful singing, beautiful costumes and sets... and gypsies, flamenco, and bullfighters!! Sunday, Nov. 18th, 8:00 p.m. IT'S GOING TO BE A FANTASTIC SHOW!! BIG FLAMENCO PERFORMANCE OF ANA MONTES AND FLAMENCO DANZARTE STUDENTS IN AUGUST!! Ana Montes and her Flamenco Danzarte students will be burning up the dance floor with their yearly Folklife flamenco performance, this time on the International Stage. Ana will be performing with Carmona Flamenco at the Northshore Performing Arts Center in Bothell (next to the high school). Ana will be performing at Folklife on the Seattle Center Mural Amphitheater Stage on Sunday, May 28..... at 1:00 with Carmona Flamenco and at 1:40 with her students!! Check both shows out! Ana will be performing with Carmona Flamenco for the Kent Spotlight Series. FINALLY, the show everyone has been asking and waiting for! Ana will be producing a big student production November 19 and 20, in which she will be dancing quite a bit herself. 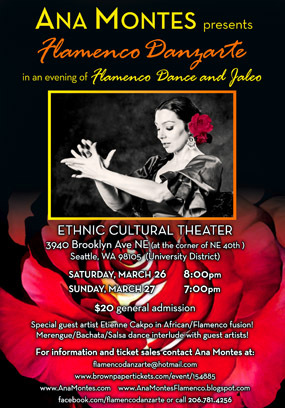 ANA MONTES & FLAMENCO DANZARTE PRESENT.... an evening of Flamenco dance and jaleo. We expect to sell out fast, so get your tickets now!! Saturday, November 19, 2005 at 8:00 p.m.
Sunday, November 20, 2005 at 7:00 p.m.
Like Opera? Ana will be performing with the Lyric Opera Northwest in their production of Bizet's famous opera "Carmen", at Bellevue's Meydenbauer Center. Friday, October 14, 2005 at 8:00 p.m.
Saturday, October 15, 2005 at 8:00 p.m. So you've seen Ana in the student production.... now see her in a full blown professional show!!! 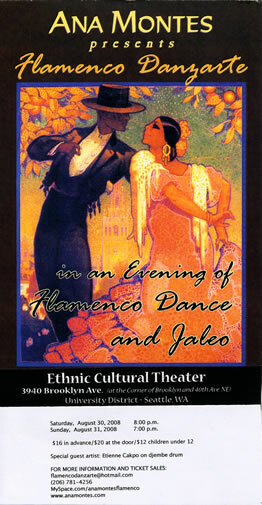 Ana will be dancing with Carmona Flamenco and male dancer Oscar Nieto. This show is very popular and is only one night so get your tickets soon!! Friday, November 11, 2005 at 8:00 pm. Ana will be perfoming with Carmona Flamenco at Porta Greek Restaurant. FOLKLIFE AT THE SEATTLE CENTER! Ana Montes and Flamenco Danzarte on the Mural Amphitheater Stage. Ana will be perfoming with Carmona Flamenco at the Campus Theater. In June, Ana will be performing an evening of gypsy flamenco with Carmona Flamenco and Oscar Nieto at the Ethnic Cultural Theater in the University District. One Night Only! Ana Montes will be performing with Carmona Flamenco and Oscar Nieto. Ana Montes will be perfoming two short flamenco numbers at a ballroom dance show at Meany Hall, presented by Pacific Dance Academy. Tickets are sold at the door for $20 and $15. Ana will be performing with Carmona Flamenco on Friday August 2 at MOHAI, the Museum of History and Industry. We will be sharing the evening with a group performing Indian Kathak dance, music and song. There will be a flamenco improvisation of bulerÍas with both groups at the end of the evening. Unfortunately due to the closure of the restaurant, the once a month show at Valdi's has been discontinued. As soon as there is a new venue we will let you know. Thank you to everyone who came to the July, 2001 student show and helped to make it a success. We totally sold out for both nights! We'll keep everyone informed about the next big student recital. Located at the corner of 1st Ave and W. Roy in lower Queen Anne Hill, Seattle, WA. © 2001-2018 Ana Montes. All rights reserved.